2006 Tiara 360 Sovran The Sovran 3600 brings with her everything that is Tiara Yachts including solid, dependable hull design, flawless gel coat finish, standard integrated composite windshield and hardtop, high-grade stainless steel hardware, and designed safety features that are built for the boater. With Tiara Yachts you know you'll have confidence in the quality and dependability that comes with decades of boat building experience. No more wrestling with canvas, the integrated composite windshield and hardtop design add unmatched cruising comfort and clear obstruction free views while sitting or standing. There is plenty of room for guests at the spacious companion L-lounge and the captain will sit comfortably at the custom adjustable helm seat. Below decks the Sovran 3600 displays the finest in custom cabinetry. The spacious interior provides plenty of elbowroom and all the comfort you need for those long weekends and extended trips. The forward master stateroom features a queen size pedestal berth with inner spring mattress, lots of storage and built-in flat panel television. 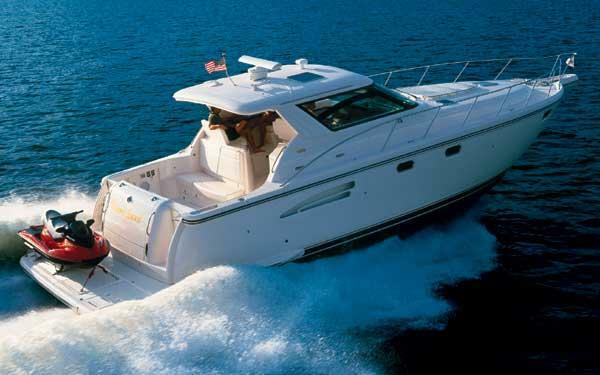 2011 Tiara 4500 SOVRAN, Tiara Yachts are the best of breed in American yacht building. This Sovran is one of their most sought after cruisers. There is a difference in this yacht and it's 4300 predecessor. The 45's come with double the cockpit AC, duel Volvo engine data read-outs, huge hydraulic lift for water toys, retractable roof, transom grill, transom trunk, etc. 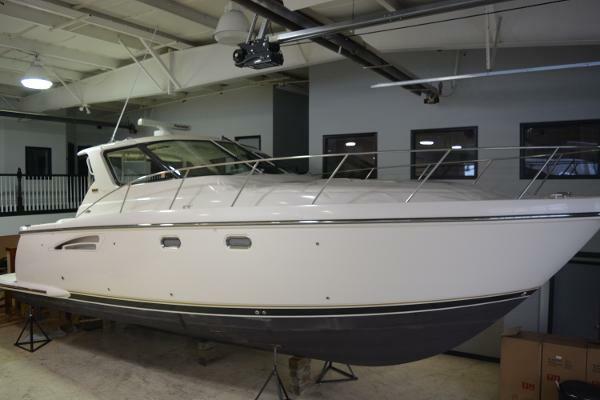 This particular yacht was purchased here new, one owner, always stored inside heated and meticulously cared for. Due to the owner's busy schedule, it is still inside heated with additional wrap. There are only 194 hours on Volvo 600's. We are advertising the pics when she was new and will update the pics when she is out of winter lay-up. Trades Considered. 2005 Tiara 4400 Sovran Tiara Yachts is proud to offer another beautifully designed and constructed yacht - the Sovran 4400. 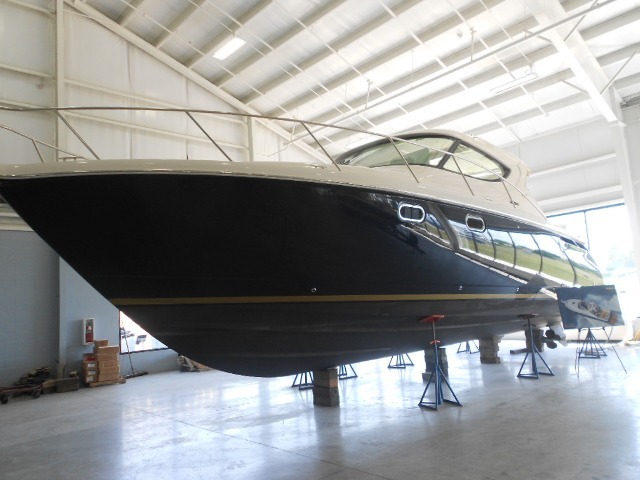 A gelcoat outer layer, high-performance tie-coat quadaxial fiberglass, balsa core, epozy resin, and vacuum bag technology lay the groundwork for a yacht that's unsurpassed in quality and simple quiet elegance. The long, sweeping deck of the 4400 is constructed with a gelcoat outer layer, hand-laid fiberglass and balsa core with vinylester resin. The beautifully crafted, custom-curved composite windshield is seamlessly integrated with the hardtop of the 4400. Behind the composite windshield, the 4400 incorporates a hinged helm console, with full engine instrumentation and an admiral full double-wide helm seat which is adjustable forward to aft, up and down. 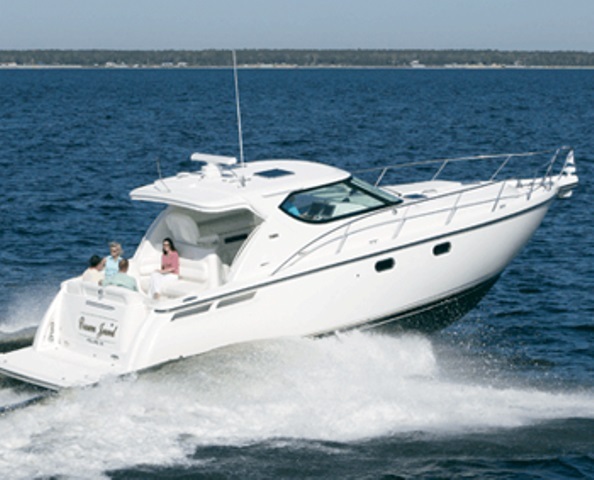 Intuitive design plus time-tested placement of gauges, throttles, and controls, ensure that being behind the helm is akin to a ride on cloud nine. 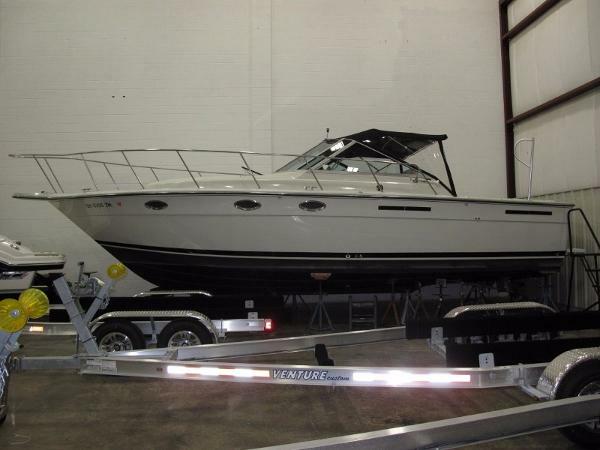 The aft of the 4400 offers a standard swim platform, extending the 4400 by an extra 52 inches. This extra space provides room for a personal watercraft, an inflatable dinghy, and / or plenty of room for family and friends to enter and exit the water on a diamond patterned non-skid surface. Rear storage space is built-in and accessed through a hydraulically actuated fiberglass hatch. Belowdecks, the 4400 features plush leather seating, Corian countertops, stainless steel sink, abundant storage, and a built-in 22-inch flat screen TV with DVD technology. The lounge features a folding birds eye maple / teak table which converts to berth, increasing sleeping accommodations to six. The master stateroom boasts a queen-size pedestal bed, with spring mattress, and storage below. The second stateroom not only comes with two overlapping, bunk style beds but also a combination washer / dryer. The second stateroom also has it's own access to the head. 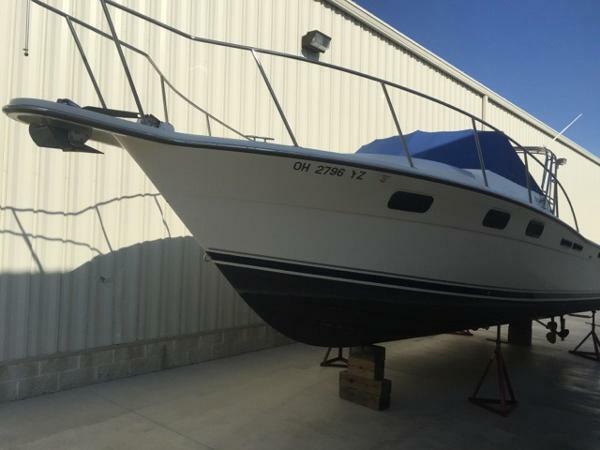 1985 Tiara 2300 Continental This 22' fishing boat comes with a Merc 228 hp engine, Hard Top( 3yrs old), and storage trailer. The boat is rigged for fishing with auto pilot and GPS/FF touch screen. 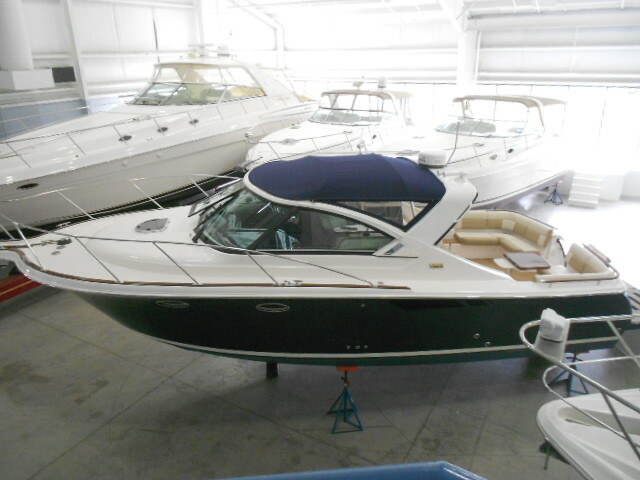 Stored inside for the life of boat. 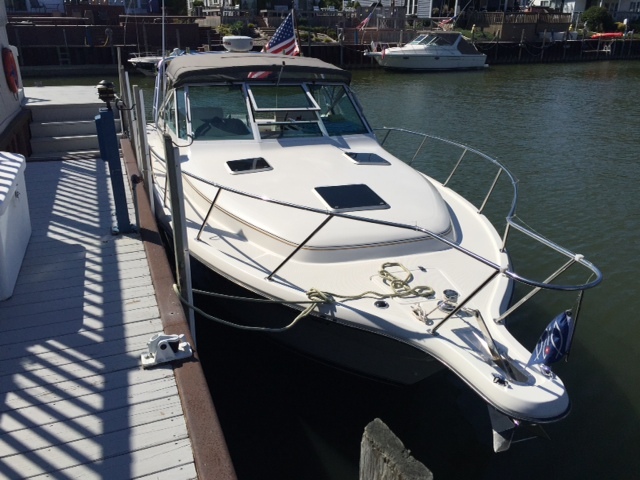 1999 Tiara 3100 OPEN, Fresh water, updated version of the Original 3100 Open has prop pockets and transom door. Large cockpit upper and lower. Beautiful teak interior. A must see Tiara. Trades considered. 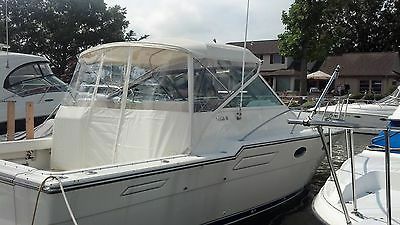 1990 Tiara 2700 Open The popularity of this boat has much to do with her builtin versatility. 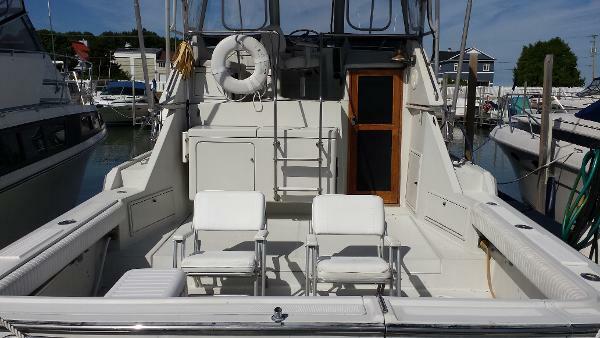 As a fisherman, her spacious single-level cockpit is completely uncluttered and large enough for a mounted chair. 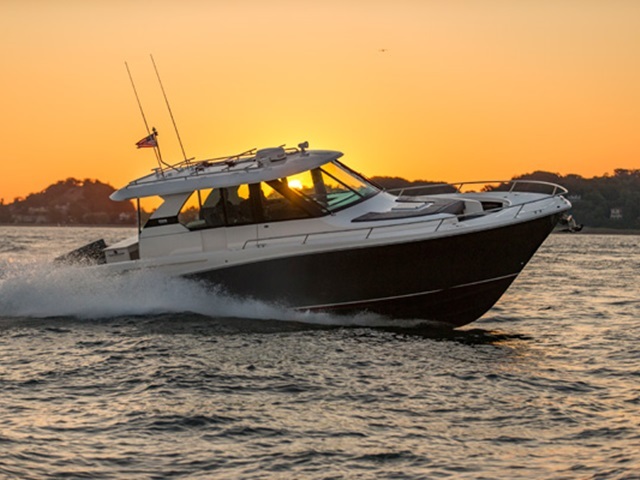 As a family cruiser, the 2700 Open offers the advantages of inboard power (most of her competitors have outboards or I/Os) and a proven offshore hull to go with her upscale interior. The cabin is arranged with a convertible V-berth/dinette forward, a compact galley with an electric stove, and a standup head with sink and shower. 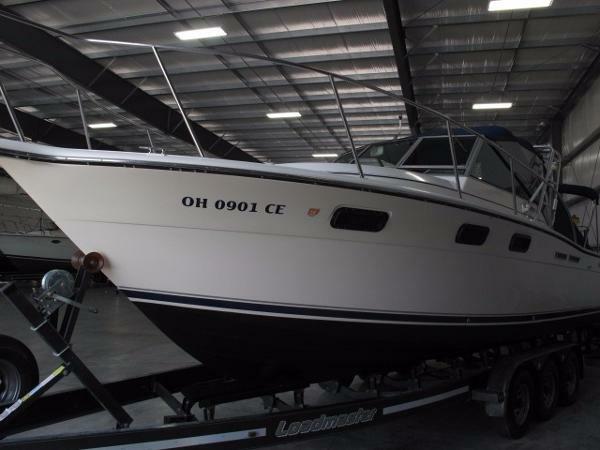 1985 Tiara 3100 Open 1985 31' TIARA 3100 OPEN Cosmetically this classic 1985 express is ready for an outing. 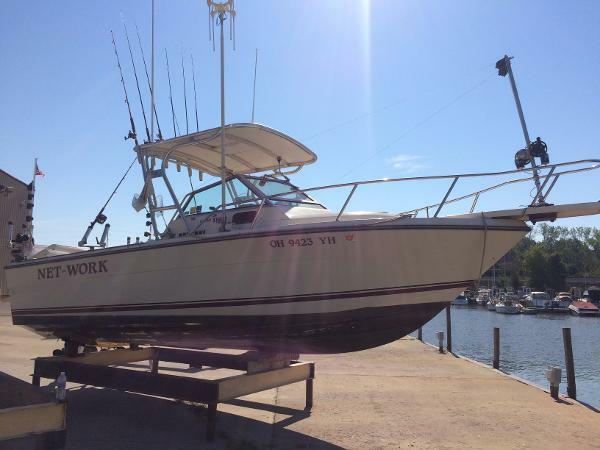 This model's versatile layout is equally well-suited for fishing or cruising. Roomy teak-trimmed interior with private stateroom, full-size dinette, compact galley, sleeps four. Large cockpit has room for several anglers without bumping elbows. 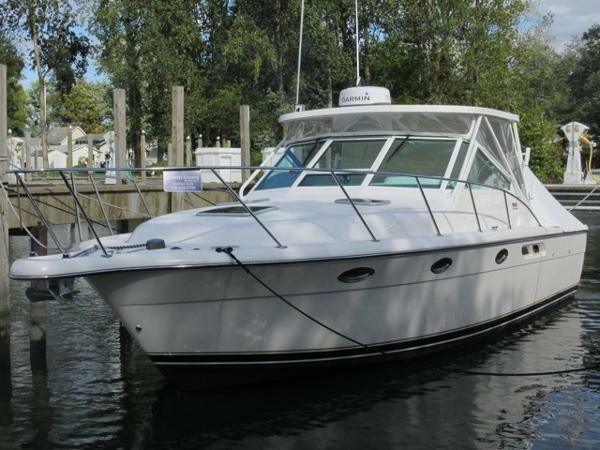 She offers good engine access, wide side decks, excellent running condition.